Località il Piano is well-suited for group activities. We can accommodate up to 12 people in our agriturismo for multi-day events, such as student excursions, yoga retreats and art courses. We can accommodate groups of 10 - 20 (or more) for daytime activities, offering the potential for hands-on classes in wild edible plant recognition and cookery, winegrape harvesting & winemaking, olive oil tasting, milking & cheesemaking, nature hikes, seminars in traditional arts (willow basket making, leather tanning), demonstrations of grafting techniques for fruit trees and discussions of the meaning and importance of sustainable agriculture. We specialize in events with an educational-agricultural focus, as both Adolfo and Darcy have PhDs in agriculture and have experience in teaching in English and in Italian. October 2010 — A group of 10 international high school students and 2 teachers came to Località il Piano for a three-day educational trip with classes and discussions of cheesemaking, organic vegetable production, bread and pizza-making in our wood-fired oven. 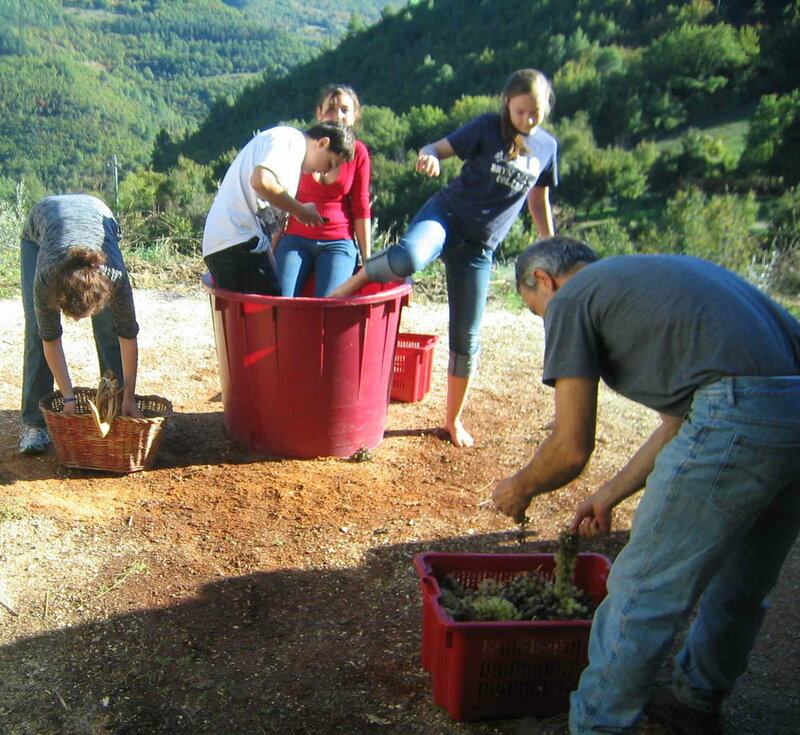 Students participated in the wine-grape harvest then squeezed the grapes the traditional way (barefoot! ), with a discussion of fermentation biology and winemaking technique. April 2011 — "Per l'annunziata, ogni erba è un 'insalata", wild plants hike and snack with ProSpoleto. May 2012 — A group of 12 from a Dutch cooking school visited Località il Piano for a wild plant-gathering hike, followed by a culinary demonstration (traditional handmade pasta) and tasting of various products using the wild plants gathered. July 2013 — Jam-tasting event pairing our unusual organic jams with sheep's milk cheeses made by our neighbors. May 2014 — Class in "Cheesemaking from barn to fork": milking the goats, making mozzarella and ricotta cheese from that milk. August 2015 — PomAdoro: tasting and evaluation of 20 varieties of heritage tomatos grown on-farm. July 2016 — Students from the Gastronomy program at the University of New Hampshire came to Località il Piano to make pizza in our woodburning oven, with farm produce and cheeses. July 2017 — Students from the Nutrition Department of the University of New Hampshire did a one-day seminar on the science of jam, and together we made blackcurrant jam, from bush to jar. October 2017 - Elementary school children picked apples and helped press (and drink!) apple cider. For further information regarding group events, contact localitailpiano@gmail.com.